Model of enzyme's structure could spur new therapies ~ Health Matters Today! In many pharmaceutical company and university laboratories, scientists are looking closely at kinase complexes because the enzymes play key roles in essential cell functions. By taking unusual steps to examine a kinase complex, researchers at Brown University and the National Institutes of Health have found a sought-after prize: an unprecedentedly detailed description of its structure complete with a rare location on its structure that could be a target for new therapeutic drugs. "Disregulation always leads to disease," said Wolfgang Peti, associate professor of medicine and chemistry at Brown University and senior author of a paper published online Nov. 6 in Nature Chemical Biology. "To make better drugs, what we want to do is look for individual things that are different between different complexes. The problem is we didn't know where those non-common spots are. We didn't have the structures that tell us the story. We were the first to get one of those structures." The complex that Peti, Brown colleague Rebecca Page, and their team has now characterized is hardly a household name: p38alpha:HePTP. It does however, matter in millions of households around the world. It is a member of the MAP kinase family, enzymes that regulate cell functions such as growth and inflammation. Diseases that correlate with disruptions to MAP kinase signaling include Alzheimer's disease, rheumatoid arthritis, and cancer. To determine the structure, the group took the rare step of combining techniques including nuclear magnetic resonance spectroscopy and small-angle X-ray scattering, using the National Synchrotron Light Source at Brookhaven National Laboratory on Long Island. 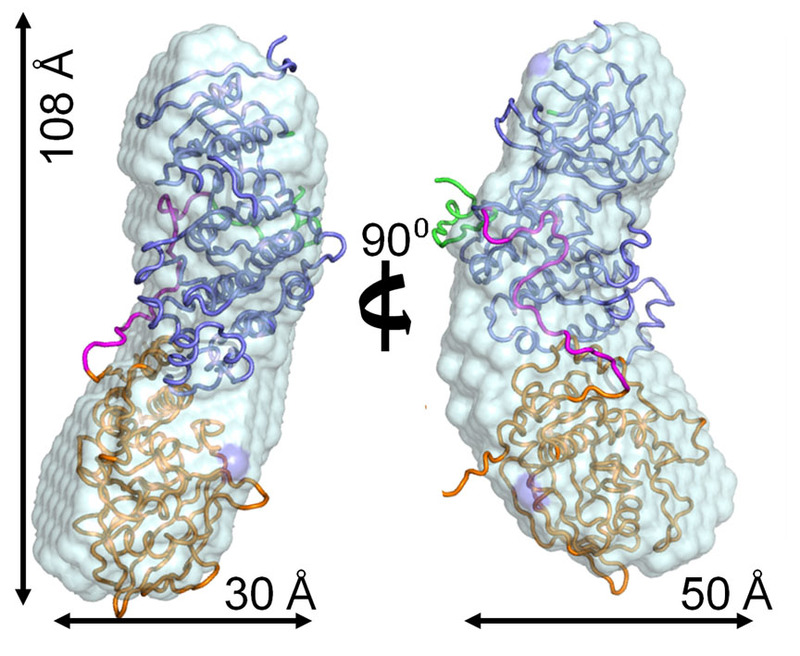 The result was the clearest picture yet of a MAP kinase complex, which turns out to measure a mere 108 Angstroms (tenths of billionths of a meter) long by 30 Angstroms wide. The resolution of their resulting model is on the scale of individual atoms. To elucidate their model, they probed the complex to discover areas where p38alpha binds to different HePTP-derived peptides. 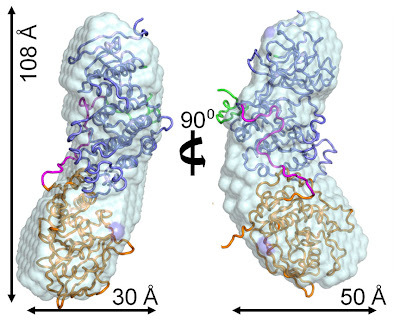 They found a specific area called "KIS" that is responsible for how the p38alpha:HePTP complex forms in its unique way. "That really showed there are these areas outside the common sites that are likely unique between different complexes," Peti said. The next step is to learn more about KIS and the role it could ultimately play in disregulation and disease. In their paper, the authors expressed optimism that their newfound knowledge will have clinical relevance: "These results provide novel insights into the molecular interactions that regulate the strength and duration of MAP kinase signaling and, in turn, provide novel avenues for therapeutic interventions of MAP kinase-related diseases."